Three years ago today I launched Brand Excitement here in Hudson County, New Jersey. At the time I was till working a full-time job, had just graduated from Rising Tide Capital’s Community Business Academy (one day before) and felt empowered, for the first time, to make a real go at being a business owner. I started part-time. Building my clientele and visibility up as I began. I had already started planting seeds the year before and had garnered enough visibility from a pilot-run business to get into O, The Oprah Magazine and get into a few local newspapers. From that “social proof” I launched on January 8 with the plans of going full time. By June 15, 2010 I had resigned from my corporate job at Mattlin Mandell and was in business full time. It was a whirlwind. The first year was getting to know what it was like to be in business. The second year, getting to know what my clients truly wanted and the third year has been understanding how to grow, hire help and continue to serve my clients. I’ll admit, I have dropped a lot of balls, but fortunately the failures are greatly outweighed by the successes. We’ve won awards from Rising Tide Capital and American Express/Count Me In and have received recognition for our work and reputation right up the chain, all the way to Evan Carmichael, making his list of the top 25 Brand Experts on Twitter. As we turn 3 (entering our fourth year) we are full of anticipation and excitement. People are starting to “get it” and branding is no longer a corporate term. Small businesses and entrepreneurs are grabbing hold of this concept and understanding just how critical it is to “brand” a business and not just build a business. As we progress through the year we’ll be releasing new products, launching new programs and planning events that catapult our community like never before. As we say in our newsletter each week… Excitement Drives Everything! 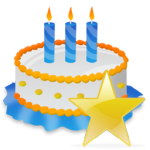 9 Responses to Today is Brand Excitement’s Anniversary! Celebrating with you!!! THat’s so wonderful ~ full of remembering the past challenges and experiences and embracing the future! Congrats! Happy Anny, congrats to you! Congratulations! Focusing on a mission is exciting for everyone to see. Congratulations honey you’ve built an amazing company and I am proud of you! What an awesome story! I have always had this voice inside of me saying to GO FOR IT I literlly launched my ministry 6 weeks ago and I am so inspired by people like you who are doing it! I pray that my minsitry and busines can follow suit and have the success I see in you! THANKS FOR SHARING!